Our name comes from the Creek Council Oak Tree located at 18th & Cheyenne in downtown Tulsa. In 1836 the Lochapoka Creek Indians kindled a ceremonial fire using live coals they had carried from their Alabama homeland over a “trail of tears. ” Of the 630 that began the trip, 161 died. This great Burr Oak tree became the site for Tulsa’s first town hall, first conference room, first church and first court of law. This revered tree still lives and remains a symbol of our early settlers’ strong spirit. It is in this same spirit of determination in the midst of adversity, of hope for a more inclusive future, and of the promise of new beginnings, that the Vocal Pride Foundation is rooted in the history of the Council Oak. The Council Oak Mens Chorale (COMC) is a fellowship of gay and gay affirming men dedicated to musical excellence in the performance of choral literature, providing a source to reach the community showing our pride, unity and support, and presenting a positive image for ourselves. The chorale was formed in 1997 from a group of 12 singers that came together to provide music for a World AIDS Day memorial service. Founded by Rick Fortner, they had no official name. Their hope was to provide support to the families and friends of those affected by HIV and AIDS. 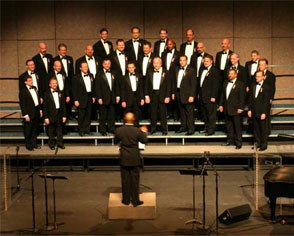 From there, the idea of supporting an ongoing gay men’s chorus in Tulsa took root. From its modest beginnings, this small group of dedicated singers has grown into an organization that is known throughout the nation for it’s vocal excellence. From a one-time memorial service, performances have grown to include a three-concert season with numerous additional performances making COMC a year-round organization. COMC performance venues include the Tulsa Performing Arts Center, Philbrook’s Festival of Trees, and numerous local churches and community organizations.